With the weather in Toronto and the surrounding areas becoming colder by the day, preventing the pipes in your home from freezing is likely one of your top concerns. In today’s post, we’ll provide you with four of the most common frozen pipe indicators. If you suspect that your pipes are at risk of freezing, then schedule a plumbing appointment with The Great Plumbing Co. using our easy online scheduling application. We perform frozen pipe thawing that can minimize the damage to your home, so schedule your appointment today! It might sound obvious, but check the visible pipes in your home for signs of frost and ice as the weather begins to dip below freezing. 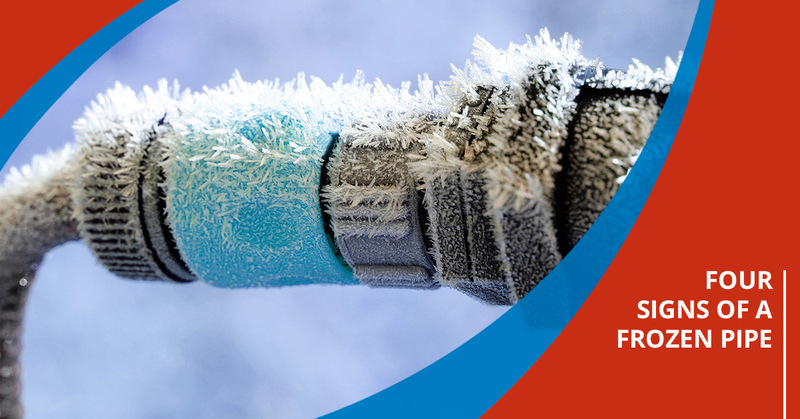 Many homeowners believe that frost or small ice crystals are expected as the weather cools down, but this is actually a sign that your pipes are in the process of freezing. Check under your kitchen cabinets, under your bathroom sink, and anywhere else that you can see the pipes in your home, and call a professional plumber as soon as you notice any signs of icy pipes in your home. Are you hearing odd noises whenever you flush the toilet or turn on the faucet? 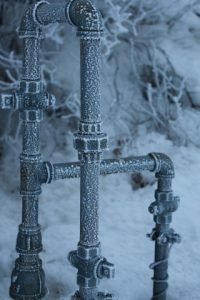 Air that has been trapped by ice will often make a bubbling or gurgling noise as it slowly makes its way through the pipes. This is generally a sign that a pipe has frozen, but not yet burst, so schedule frozen pipe thawing immediately if you hear either of these noises. In some cases, the water making its way through the blockage will emit a whistling noise, so be on the lookout for that as well. Many homeowners panic and assume that a pipe has burst when they discover damp walls, but this isn’t necessarily the case. Your pipes might be freezing during the night and then warming up as the temperature increases throughout the day, causing your walls to become wet in the process. Be on the lookout for puddles on the floor as well, as condensation will often drip into the space between your walls and then into your home. Are you having persistent problems with your plumbing? Many older homes in Toronto have inefficient plumbing, but you should keep an eye on your plumbing’s functionality as the weather cools down. Water may take longer than normal to come out of the faucet, or your toilet may clog almost every time you flush it. Instead of chalking new issues up to outdated plumbing, schedule a residential plumbing appointment to err on the side of caution. Even if the problem turns out to be minor, you’ll be reassured that your home is safe throughout the winter. The Great Plumbing Co. is proud to provide a number of residential plumbing services in Toronto and the surrounding areas. From frozen pipe thawing to drain repairs, we do it all! Book your appointment with a Toronto plumber online today.